When did “sales” become a dirty word? Home > Recent Press > When did “sales” become a dirty word? By Frank Koechlein for the CUInsight, June 11, 2018. A few days ago while watching TV; I had the opportunity to see the new Wells Fargo commercial. My guess is this ad is an attempt to help repair the damage to the Wells Fargo brand resulting from their recent retail banking scandal. The ad in addition to showing a lot of happy and engaged customers stated; “we have eliminated sales goals in order to better focus on customer satisfaction.” This struck me as an odd statement; what has happened to our service culture that offering additional products and services is at odds with member satisfaction? The statement speaks volumes about the way many credit unions (and community banks) see themselves. Both institutions have a long history of being service organizations. Credit unions remain one of the few types of financial institutions that truly function for the benefit of their membership. For example, the mortgage for my son’s first home was from his credit union at work. Not only did they help him through every step of the process, he was able to get a discount on closing costs and get one of the lowest 30 year fixed mortgage rates in the Atlanta market. Now that is service. Many in credit union leadership positions look upon organized marketing/selling programs as going counter to the core of the credit union mission. In my opinion this belief comes from the “old school” definition of selling. This high pressure form of selling is not focused on member needs but on the credit union’s needs. An example, if the credit union needs to sell home equity loans, all of its members are prospects. This type of selling many times can have a negative impact on how members feel about your institution. As a member, if you’re asked about a home equity line of credit and you are not a homeowner, it doesn’t feel very personal. This shotgun approach is what worries many in leadership. With credit unions historically functioning as a service organization, the focus for member facing associates has primarily been transaction based. Members define their needs and come into the credit union for help in solving their financial challenges. In this scenario activities aimed at learning more about your members (asking them questions) is considered intrusive. Generally speaking, credit unions need to make the transition from being service organizations to selling additional products (serving members) based on member needs. 61% of responders in a recent Affinity FCU/Harris Poll “believe credit unions care more about their members than banks do.” With this type of member trust in their institution, doesn’t it make sense that a needs based selling approach would prove effective? Gaining a greater understanding of your members can be difficult in today’s digital world. Younger members prefer to interact with their credit union using remote access including; online, mobile, phone, SMS, making it difficult to discuss someone’s financial challenges face to face. Gaining a greater understanding of members’ financial needs and using it for marketing purposes, should happen on their terms and with complete transparency. One challenge with starting a needs based selling program is that your organization needs the tools to learn more about your members. This knowledge drives cross-selling programs that sell product and reinforce the positive qualities of your brand. The lack of adequate tools to gather member data seems to be a source of frustration for many in credit union leadership. 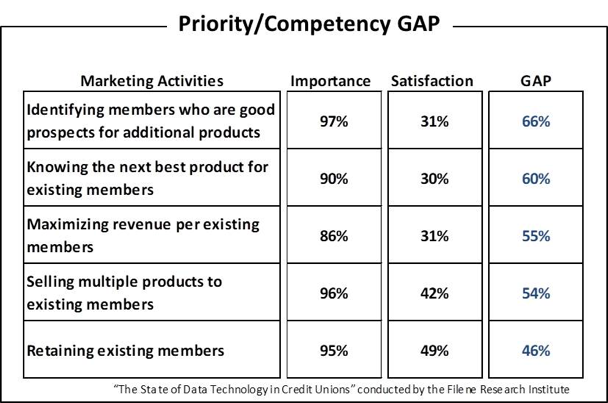 The research below was conducted by the Filene Research Institute (RFI) and it compares the importance of 5 critical member marketing/sales activities versus the ability of their credit union to accomplish the task in a satisfactory manner. These numbers are striking and they illustrate the depth of the challenge credit unions face as they evolve from pure service organizations to a member needs driven service paradigm. One caution, needs based selling clearly needs to be consistent with the credit union’s brand values. If you look at the 5 activities listed in the RFI research; the gap for all 5 can be closed with a greater understanding of the financial needs and service preference of members. If that’s the case why isn’t credit union leadership more receptive to using member data to close the gap? From industry research it is clear that smaller credit unions are resistant to data-driven marketing to their member base. Research conducted by the Financial Brand last year found that less than 9% of all credit unions/community banks under $1 billion in assets are using data to drive member CRM and retention activities. The same research showed that more than 50% of their larger competitors are using member data to drive improved CRM, retention and new member acquisition activities. The time has come for the credit union community to embrace new data management technologies to better serve their members. A common misconception is that using member data analytics will change way the organization will serve their members. In short, they will lose the personal experience and treat members as numbers, not people. In my experience, this will not happen if you work closely with your analytics vendor to make sure they understand your goal is to use member data as an extension of your brand. The final solution involves not just the analytics but the way you creatively present product and other communications to your members. Personalized offers that are appropriate for each member’s circumstances, presented in a way that supports your brand, in the preferred service/media channel can only serve to increase member loyalty.